Facebook seems to be really scraping the bottom of the barrel with the ads it puts in user feeds. Based on a small study with an N of 1 (me), they are based on a mindless and offensive algorithm that assumes that because I am a lady I must also hate my body – and there’s money to be made off of that! It’s not only anti-feminist, it’s simply tacky. 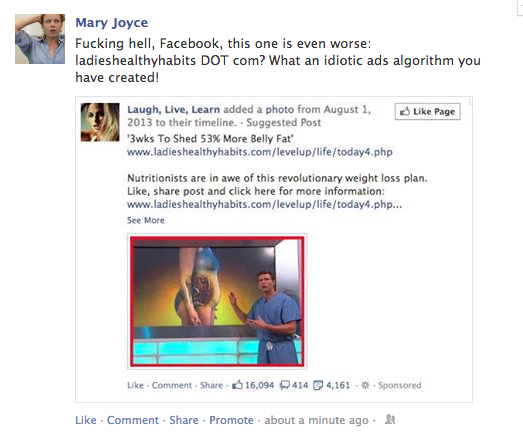 Â I expect these kinds of ads on shady link-bait sites, but not on Facebook.